A top-notch selection of bags and cases that won't let you down - although they carry a price tag to match their quality. Made from hard-wearing, durable materials. Lockable zips. Lots of storage options. There's no point in shelling out big bucks for gear if you're not going to keep it in shape, so a sturdy batch of bags and cases is a must. 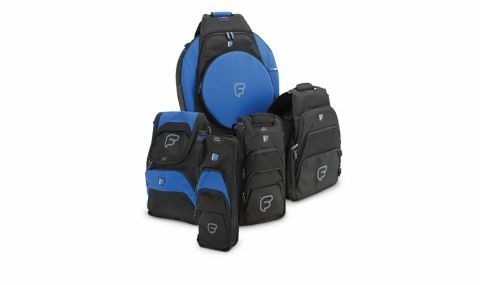 Fusion has a solid reputation for its guitar, keyboard and laptop bags and now it's also offering a whole host of drum cases. We have been sent a full complement of bags - cymbal (Beat 22), Beat Snare BackPack, a pair of stick bags (the Beat 6 and Beat 12) and a general purpose Beat Pro BackPack. The bags feature high-density foam padding to give your snare and cymbals more than adequate protection while they're being thrown around in the back of the car. Lockable zips and a multitude of compartments are also found throughout the range. "These are sturdy bags and cases - well up to the job"
These are sturdy bags and cases well up to the job. The Beat 22 cymbal case is reassuringly packed with foam and fleece cymbal dividers, catering for metals of up to 22" and even an inbuilt stick bag. It also features padded handles, back straps and it can be attached to a wheel trolley, giving plenty of options to help you lug your cymbals around. The snare bag ships with 30mm of padding and includes a removeable stick bag. Moving to the standalone stick bags - the Beat 6 is the runt of the litter but still large enough to fit a generous handful of sticks, but the Beat 12 is a class act in keeping with the rest of the bags under review here, featuring extra handles, straps and meshing and folds out to reveal even more padding and concealed areas. All cases feature tons of compartments to stash drum keys, felts etc. Even more impressive is the impeccably executed stitching - these will not let you down and after our highly concentrated test, we saw no sign of stitching strain whatsoever.